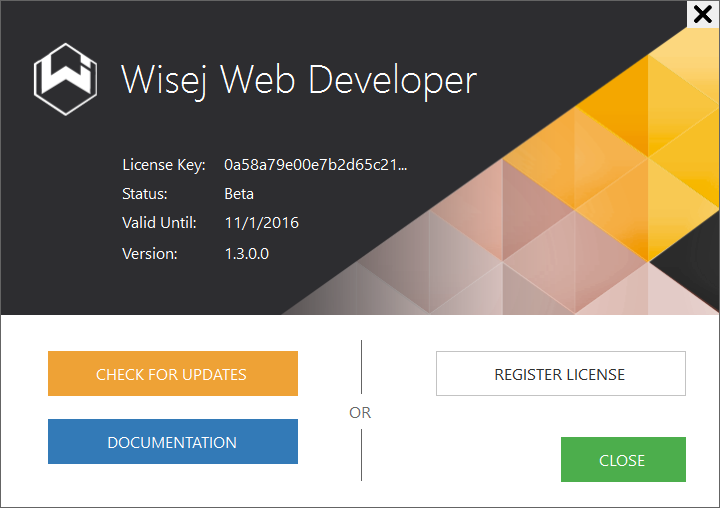 I just installed the final version 1.3.0 (not Trial) with my Wisej Web Developer License. 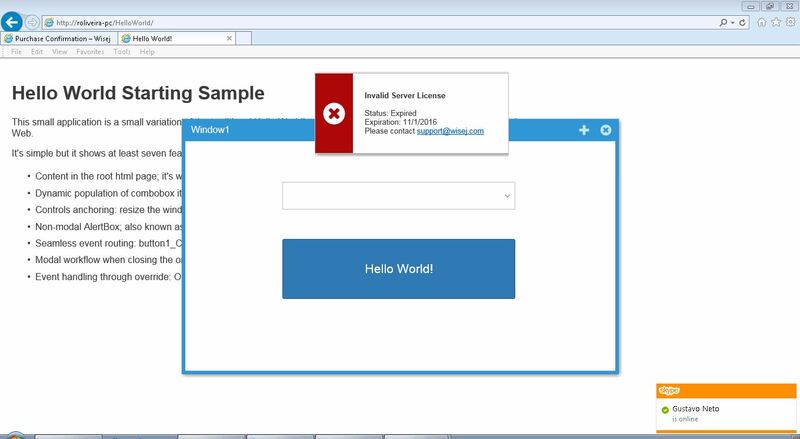 But when run the published Hello World application in IIS appears the popup message “Beta Server License Expires on: 01-11-2016”. I don’t know if is relevant, but after Wisej installation didn’t appear any dialog to enter the license codes “License Activation”. But the message “Beta Server License Expires on: 01-11-2016” don’t disappear. Tried again to activate the server license replacing the code in web.config without success. The developer license is needed to open the designer in Visual Studio. The registration form shows up automatically if it’s the first installation (no license found) or if the license expired. Otherwise you need to click the wisej icon at the bottom right to show the registration form. If the existing license is a trial or beta, there is a REGISTER LICENSE button that will let you enter the new Developer License. It can replace an existing one. Wisej checks the license key when the application is loaded and saves it on the server so it doesn’t have to load the license over the over. It’s loaded and activated once. If the key in Web.config is different than the locally saved license then Wisej will activate the new key and download a new license. When the license expires, wisej will also automatically try to download the renewal without requiring any manual intervention. That is only in case the installed version is newer that the license expiration date since licenses are perpetual – what expires is only the free update period. If you have a developer license, you have received two keys: a developer key (that you used on VS) and a server key that you must use on the web.config of all the applications you publish on IIS. Frank will correct me but as far as I understand the developer key can be activated three times (home, office and laptop). How to activate server license? Is just by write it in web.config? I guess you have to browse the web site. Great! I already activate the developer license the Wisej icon. But I still having the same problem when publish the Hello World project to the IIS, the same popup message saying “Beta Server License Expires on: 01-11-2016”. I changed the “Wisej.LicenseKey” in web.config with my Web Developer License key, but without any success. I guess you already have a non beta licence, meaning a trial license or a developer license. In order to activate it, open a Wisej project, open the designer view of a page or form and click on the Wisej icon at the bottom right corner of the designer. A popup whill show where you can enter and activate your new license key. Cheers Tiago – I wasn’t aware of the popup – all sorted now. Hi same here – I’ve downloaded the 1.3.0 build but never get prompted for a license key. Is there some other step required when coming from the beta?